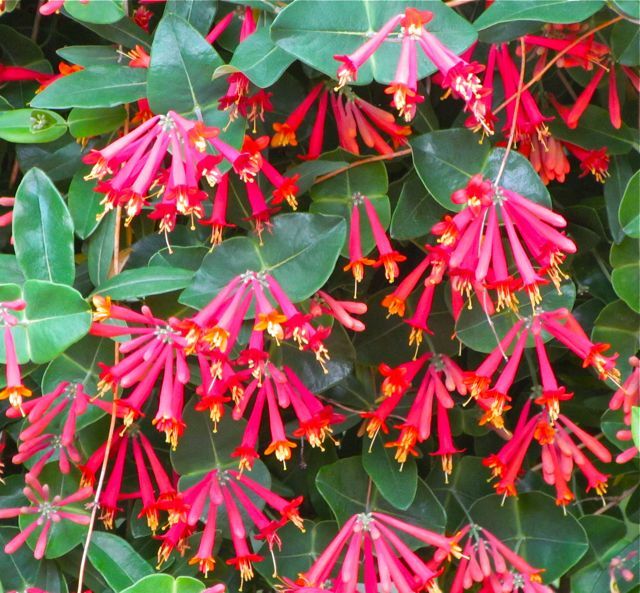 That’s a cultivar of native coral honeysuckle (Lonicera sempervirens ‘Major Wheeler’) blooming in the photo above. I wrote about it previously here. It is at maximum spring bloom on my front trellis at the moment, and I thought the flowers made a fitting celebration of my 100th consecutive blog entry. Happy 100th Day Birthday, Blog! The biggest challenges to making daily entries occurred in the last few days. My cable provider (with initials TW) has been spectacularly unreliable since last Thursday. Cable has been randomly working, usually at sub-par rates, and often connectivity was completely down. That’s why I’m writing fast and early today, in the hopes of ensuring that my 100th entry makes it to the Blogosphere. I use WordPress software, and I must say I like it very much, including the statistics it provides. For example, my average views per day were 13 in January when I started, 14 for February and March, and so far in April, I’m averaging 24 views per day. I attribute the leap in viewer numbers to the onset of the growing season, and my use of keywords. WordPress tells me what search terms (and how many) are leading viewers to my blog, and from that data, I can tell you that well over two thirds of views of my blog are the result of searches. This pleases me, because it leads me to believe I am providing useful information to southeastern Piedmont — and perhaps other — gardeners. The more the merrier, I say. Another interesting (to me, anyway) statistic is the number of views per month. In January, 227 views, February blog posts got 387 views, March was 426, and so far in April, my site has been viewed 582 times. Again, this is mostly due to searchers who hone in on the keywords I assign to my entries. My other Magnolia family entries have also been popular. It’s nice to know I’m not the only Magnolia-obsessed gardener out there. As spring eases into summer here, I find I still have plenty of material for daily entries, but the increasing pace of the gardening season is making it harder for me to find adequate time at the computer. Therefore, as of today, I’m no longer committing to producing daily entries. I’ll post as often as I can — every day or so, I hope — but I’m making no promises. I do promise to continue to take frequent pictures, to ensure I can illustrate whatever topic I write about. I’ve received enough feedback to know that you folks do enjoy the photos. Thanks to all who are reading Piedmont Gardener. I hope we can grow together, as I continue to document my obsession. This entry was posted on April 25, 2011, 6:41 am and is filed under piedmont gardening. You can follow any responses to this entry through RSS 2.0. You can leave a response, or trackback from your own site.